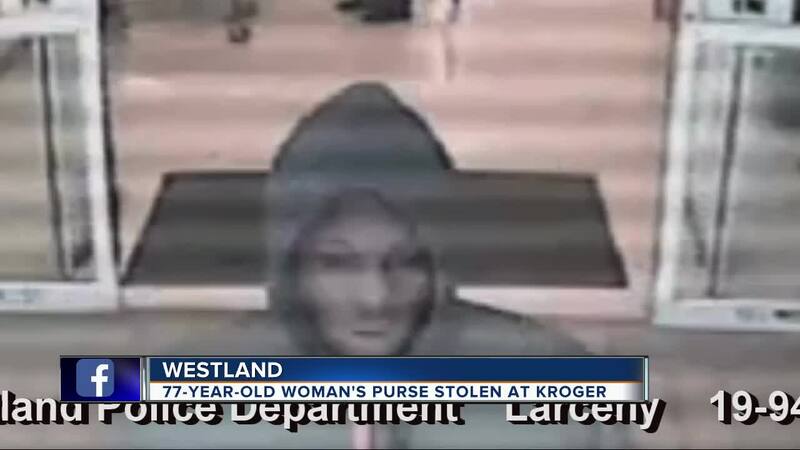 Police are searching for a suspect who stole a 77-year-old woman's purse from Kroger. WESTLAND, Mich. (WXYZ) — Westland Police are searching for the thief who targeted 77-year-old Franchella Foreman as she shopped in Kroger on Michigan Avenue near Merriman last week. "I'm a senior citizen on a fixed income and he took from me what little money I had to shop with," Foreman told 7 Action News. Foreman was grocery shopping when police say the thief grabbed her purse from her shopping cart the moment she looked away. "It looks like a crime of opportunity," said Westland Police Sergeant Robert Wilkie who told 7 Action News that it looks like the only reason the suspect entered the store was to find an opportunity to steal from somebody. "They were in the store for less than two minutes." The suspect is black, but it's not clear from the video if they are a man or a woman. The person is seen on surveillance video wearing a hoodie under a gray coat with what appears to be a pink zipper. They were also wearing gray pants and black shoes. Click on the video to hear from police and Foreman who says she's so worried now that she no longer feels safe using a purse. Anyone who can help identify a suspect is urged to call Detective Liess at 734-467-3189.